1. Click on the Buy bottom on the Select English Information page. 2. 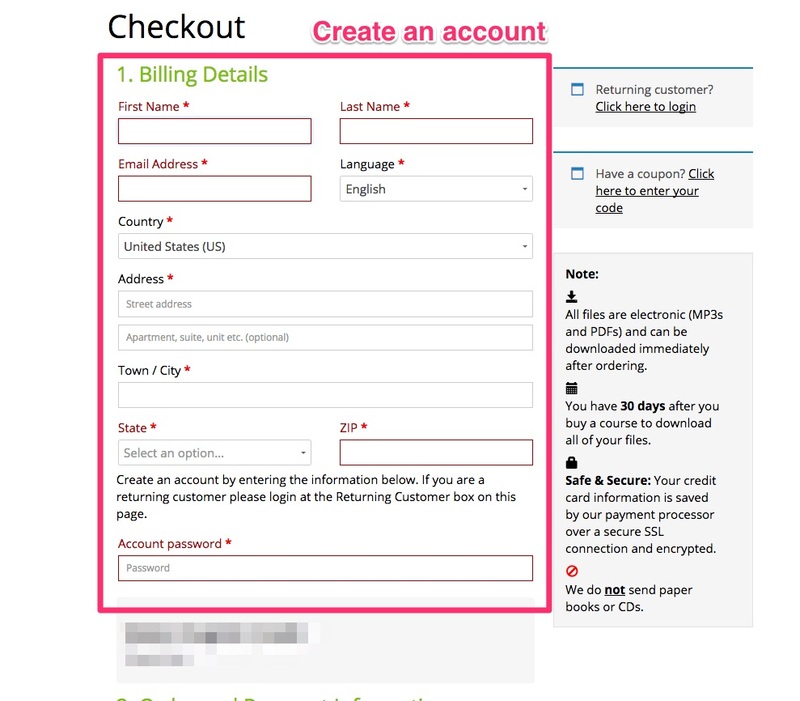 On Checkout page, enter your billing details to create an account . 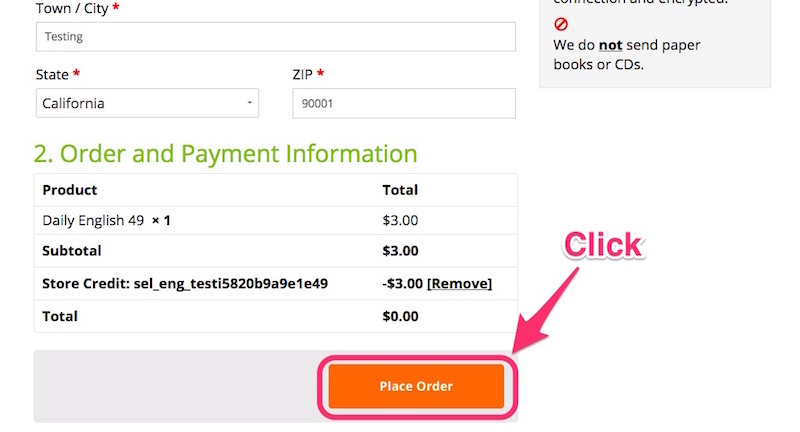 . .
and payment information (credit card or Paypal), then click Place Order. 3. That's it! You're now a member. Your membership gives you 15 new lessons every 30 days. Click on Find Lessons to select your lessons to download. 3. 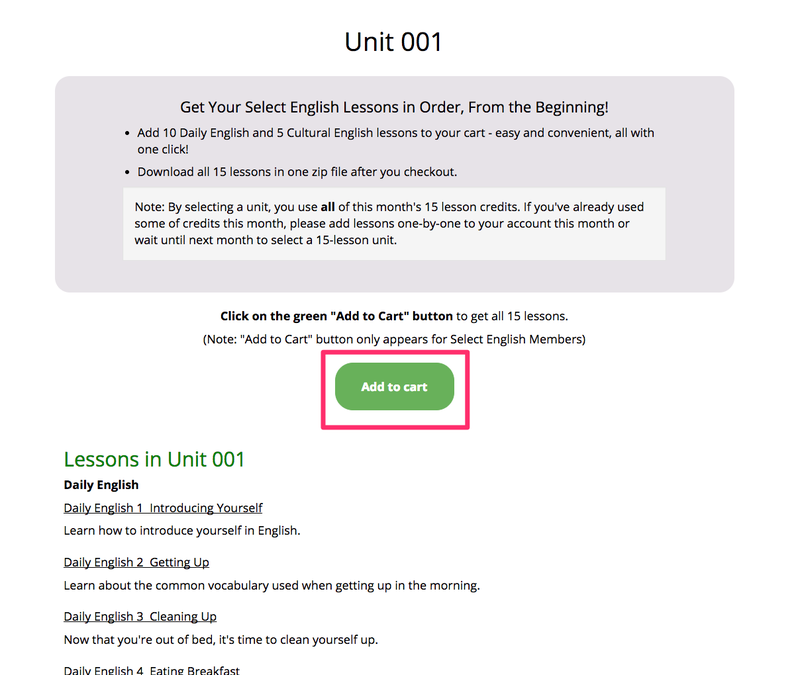 Click on the Unit button to see list of included lessons. 4. Click on the "Add to Cart" button. 5. Click on the green Select English credit button and then . . .
7. Go to bottom of Checkout page and click Place Order. Note: You can also go to the My Account area anytime and click on the My Downloads button to download your files. 3. 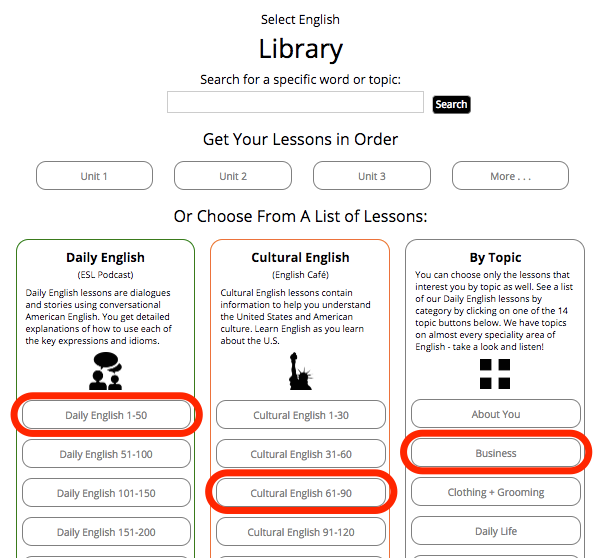 Click on a lesson type or topic you're interested in. 4. 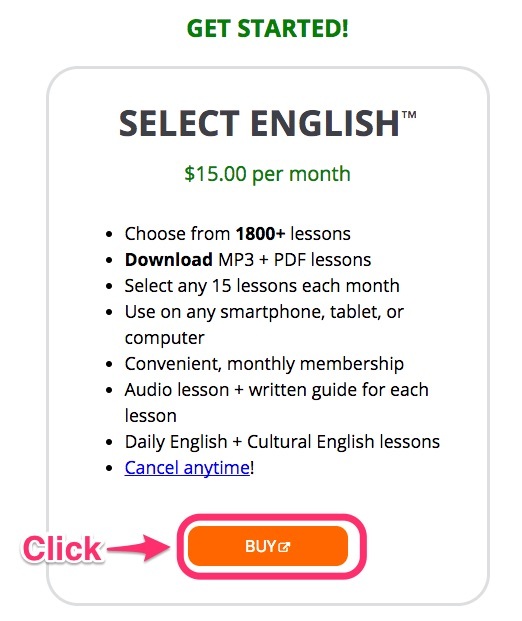 Click on a lesson you want. 5. Click on Add to Cart button. 6. 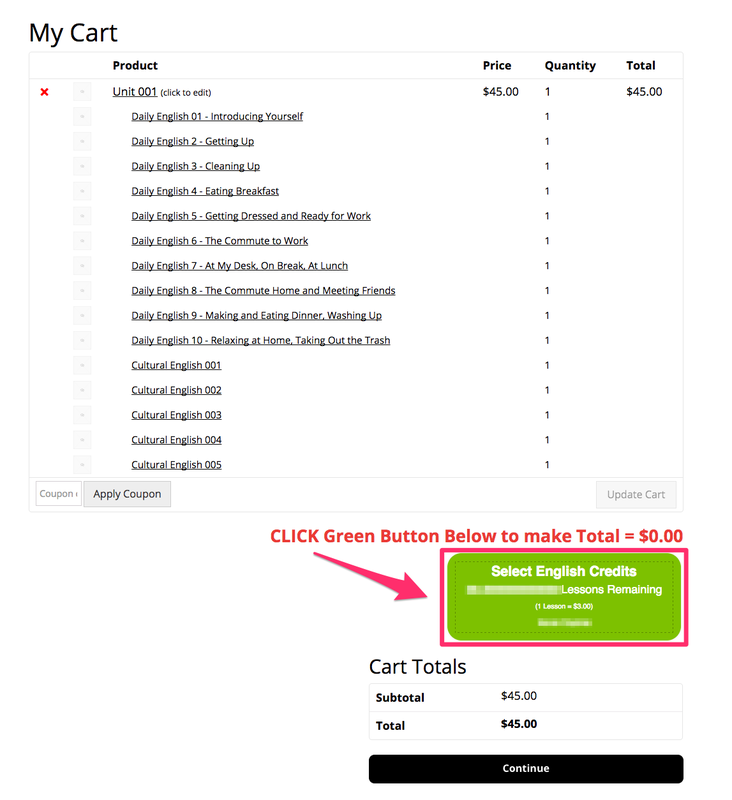 Click on your green Select English credit button and then . . . Remember you have 30 days to use your 15 credits and 30 days to download your MP3 and PDF files. 2. 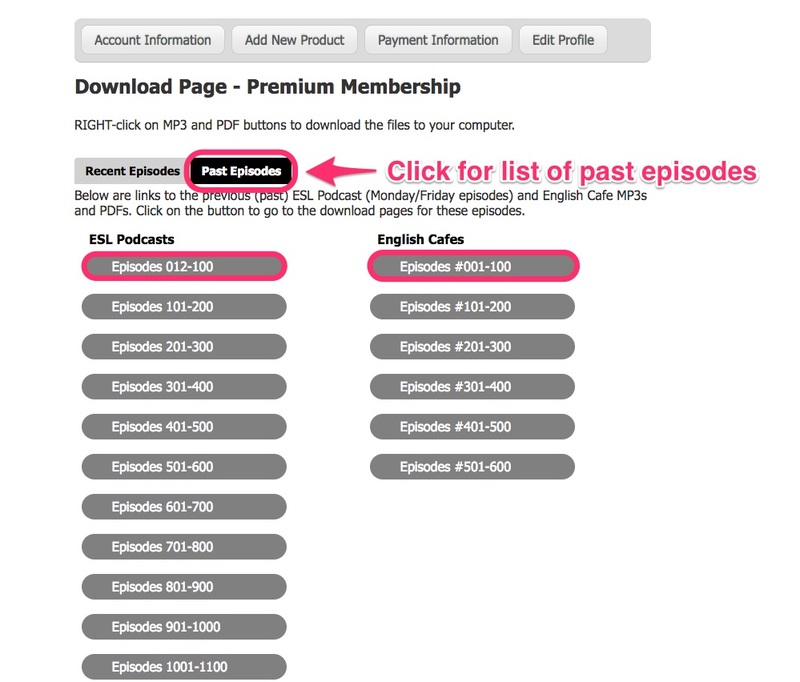 Select a Unit or a list of individual episodes. 3. 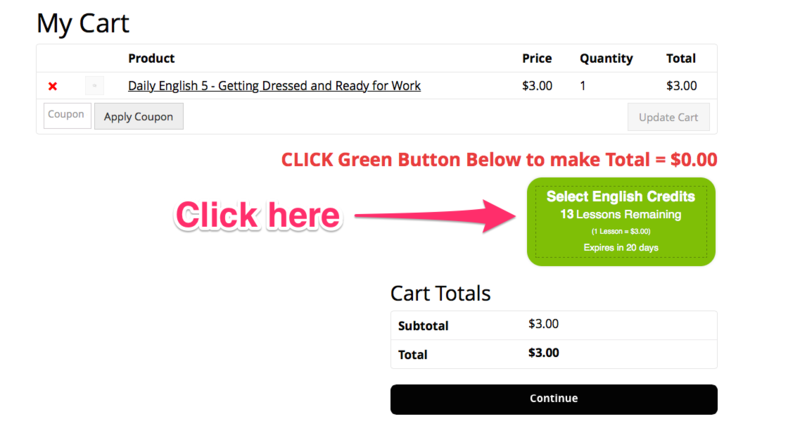 Click on Add to Cart button. 4. Click on "Yes, I want this lesson." 5. Click on “Download." Go directly to your Download page to download the lesson. 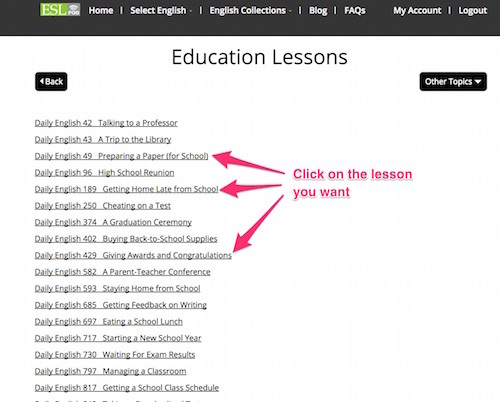 Click on "Continue Shopping" to select more lessons. 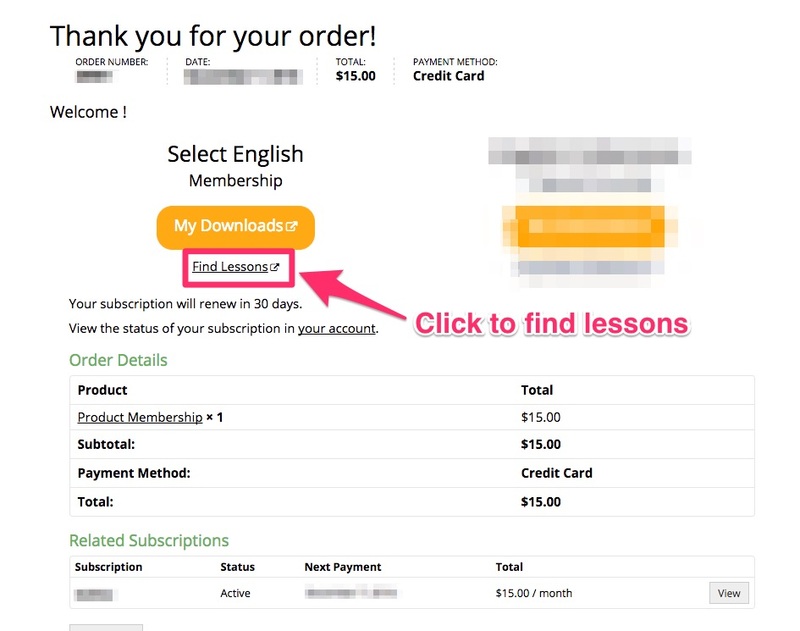 Go to your Download page when you are done to download all of your lessons. 2. 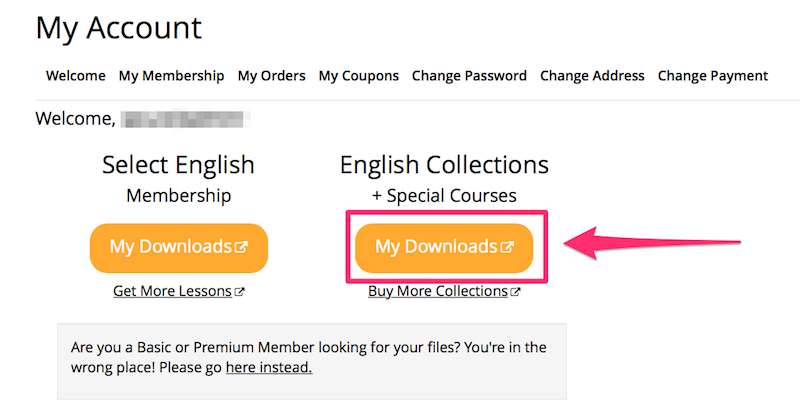 On your My Account page, click on My Downloads button below "English Collections + Special Courses." 3. 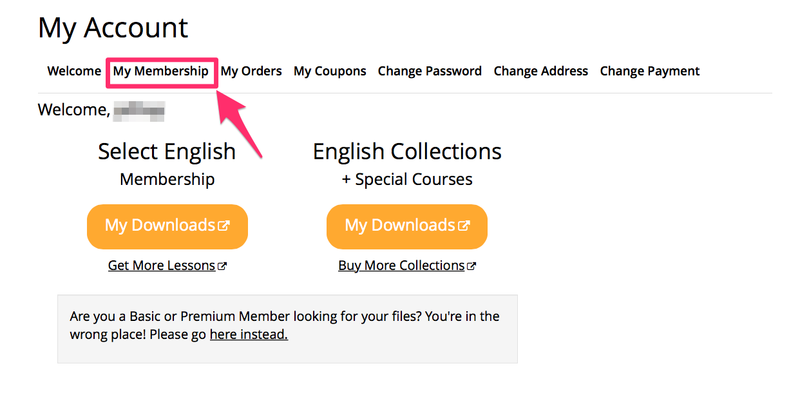 Click on the name of your English Collection set or Special Course. 4. To download all MP3 and PDF files at cone, click on the Zip button. Warning: This is a very large file! Only use on a fast Internet connection and with unzip software. Do not attempt on a phone or tablet. To download files individually, click on the MP3 and PDF links. Files will download to your hard drive after you click on them. 5. We recommend you download your files to your computer first, and then transfer them to your smartphone or tablet. In most cases it is not possible to download the files directly to some mobile devices. 2. 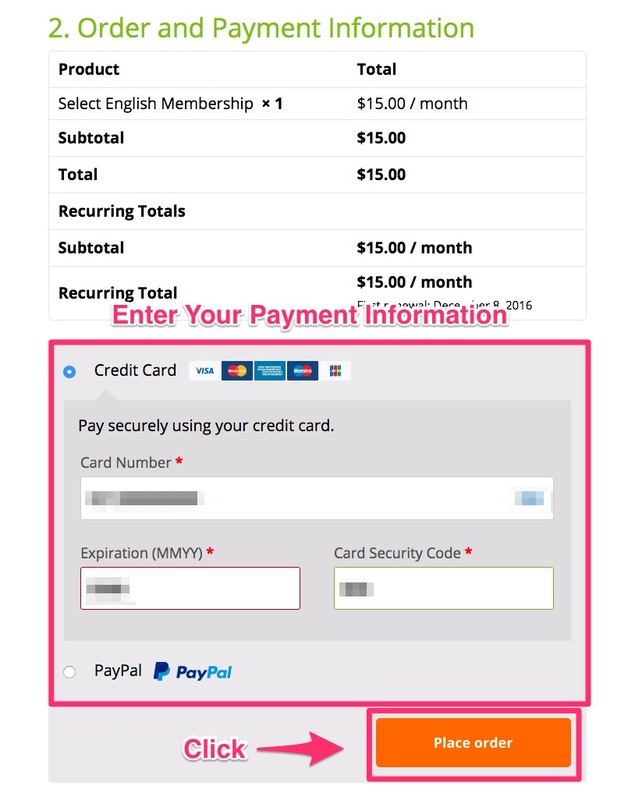 On your My Account page, click on My Membership. 3. 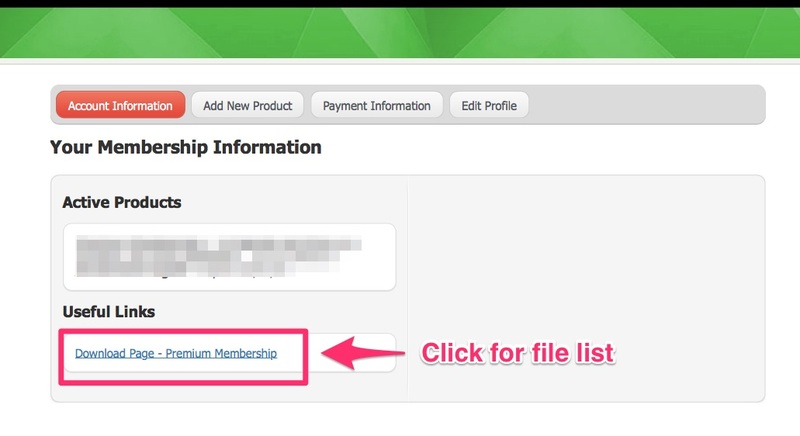 Click View next to your active subscription. 4. Click on Cancel button. You can cancel your subscription anytime during your 30 days. Remember must use your 15 credits before your membership renews or expires, and that you have 30 days to download your MP3 and PDF files.